Celtic Football club is most likely to end their 10 year kit suppliers partnership with US giants Nike as rumours are circulating that New Balance (parent company of Warrior) has signed a kit suppliers contract with Celtic which will come into play from the 2015-16 season. Current Celtic kit suppliers are Nike who has been working with the club since 2005 when they signed the 5 year deal which was extended to another 5 years in 2010 and will expire at the end of the current season. Nike has no intention of renewing the deal with Celtic so the club is already looking to secure kit suppliers deal for next season and according to rumors they have already signed contract with New Balance who officially enter the football kit and boot market at the start of this week. Celtic-Nike kit deal was worth £25 million for 5 years and now Celtic will be looking somewhere around the same price tag on the kit deal as they looking for new suppliers. According to New Balance official twitter company will announce the new club acquisitions shortly. 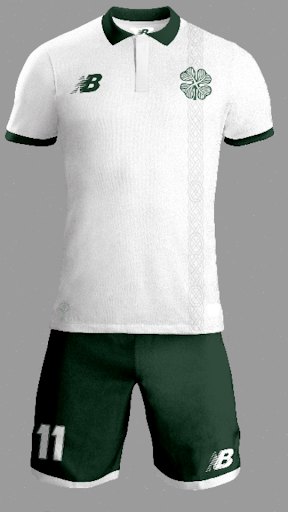 Here is a mocked up Celtic Kit with New Balance logo and inpired design by fans. this is of course not the official kit for 2015-16 season as Celtic or New Balance yet to announce their deal.